Many equate being pregnant with being able to eat “whatever” you want. After all, you are eating for two! However, there are many foods that are off limits during pregnancy. This unique lesson engages students by having them individually examine an assigned food to ascertain whether it should be eaten or avoided during pregnancy. With their newly acquired knowledge, they create a mini-poster using technology for use in a gallery walk activity. From there, t-charts are created and a group discussion ensues as to the correct placement of each food. “To eat or not to eat? That is the question.” Give it a try and see if your students aren’t highly engaged as they discover the answers to this infamous question. Show students the photo included in the PPT below and ask them to “title the picture” and then share. 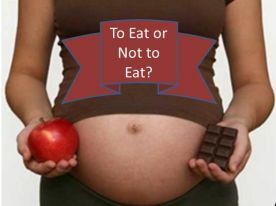 Follow with the myth or fact prompt: “Pregnant women can eat WHATEVER they want.” to see how students respond. This is a good lead in to the activities included in the lesson. Students will randomly select a food or food topic from the can and use the internet to determine if the food is safe to eat during pregnancy or if it should be avoided. 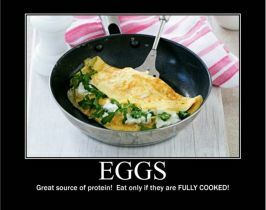 Students need to save a picture of their food along with the information they discovered about it’s consumption during pregnancy and any reasons or guidelines about the food to create a motivator mini-poster to be used in the next part of the lesson. The mini-posters will be created using the website Big Huge Labs found here. I did an egg example with them so they could see what they needed to do. After students created their mini-posters and printed them out, I numbered them and set them up around the classroom to be used in a gallery walk. In the gallery walk, students circulate around the room and write down the foods and the recommendation/guidelines as to whether it can be eaten or not throughout pregnancy. Finally, students take all of the foods and create their own t-chart, categorizing the foods as eat or avoid. We then go over their placements and discuss for correctness. I like to follow-up this activity by showing students this video to review all of this information. From here, I teach about the prenatal diet and MyPlate using this lesson.